Exciting 4 day canoe trail on the Zambezi. Be self sufficient for 4 days, a refreshing feeling. Watch wildlife as it comes to the waters edge. Enjoy the peace and tranquility of the beautiful river. 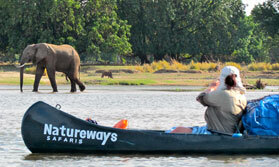 A canoe trail is an excellent way to explore the Zambezi and get close to nature. It is a journey will take you along 75kms of beautiful river ending in the UNESCO World Heritage Site of Mana Pools. It's easy paddling, interspersed with hearty food, relaxing and peaceful siestas and camping on remote islands under the stars. You are totally self-sufficient for the trip which simply adds to the satisfaction. The trail begins in Chirundu, which you reach by 4x4 transfer. From here you take to the canoes and follow the river downstream. Each day begins with coffee and biscuits then you pack up camp and canoe for a couple of hours while it is still cool. Then you break for a hearty breakfast and more canoeing, taking in the sights as you go. A shady spot on an island will be found for a siesta and you can rest during the heat of the day before picking up your paddles once more and making for your camping spot for the night. This trip is a wonderful way to enjoy the sights and sounds of the river and its inhabitants. This region has abundant wildlife including elephant, buffalo, impala, waterbuck, hippo, crocodiles and abundant birdlife. Whilst lion, wild dogs and leopards inhabit the area, it is less likely that you will see these from the canoes. The trip involves 2 full days and 2 half days paddling in 8ft Canadian canoes. The paddling is generally easy, though a reasonable level of fitness is required. Each day is different and brings its own highlights and it's sure to be an adventure to remember. Open: The canoe trail operates year round but routes may vary. Location: The trail starts at Chirundu and you travel approx 75km downstream to Mana Pools. You return to Kariba by 4x4 vehicle at the end of the trail. Rooms: The dome tents accommodate up to two people and are equipped with camping mattresses. Sleeping bags and liners are provided. There are no ablution facilites, this is bush camping. Guests are provided with a spade, toilet paper and matches to burn the toilet paper. Bathing is done from a bucket using water scooped out of the Zambezi River. Activities: The trip begins with a 4x4 drive from Kariba to the start of the trail. You'll be paddling on the Zambezi in 18-foot Canadian canoes which take 2 people. They are comfortable and stable. Each person is given a single paddle. You'll be setting out just after dawn each day, while predators are still active and may be spotted, stopping to enjoy a hearty brunch and a well-earned siesta around midday. You'll head out again in the comparative cool of the afternoon, reaching camp before nightfall. The trail ends at mid-morning on day 4, when you will be transferred back to Kariba in a 4x4. Facilities: You'll be staying in fly camps and you erect your tents each evening. Meals are cooked over the camp fire. Wine is served with dinner and 2 litres of water per person per day is allocated. You can carry your own extra cold drinks, beer, wine etc and a cool box will be provided. Beers and soft drinks should be purchased in cans where possible to reduce weight. Children: Children of 14 years and over are welcome to join the canoe trail. Communication: There is no internet access on the trail. Notes: Most of the paddling is with a gentle current, but a reasonable level of fitness is required. There is a strict luggage limit of 10kg per person on the trail. Extra luggage can be left at the main office in Kariba. We know and love Zimbabwe, and would be delighted to help you plan your perfect trip here. Let us help you plan your perfect tailor-made holiday to Zimbabwe. Talk to one of our travel experts. Tell us what you want, and we will tailor make your perfect trip. This itinerary includes a bit of everything that is beautiful about Zimbabwe and shows you some of the country's best bits!